The Ranthambhore National Park is a well known and one of the biggest wildlife reserves in Northern India. In the Sawai Madhopur district of Rajasthan, this reserve is a heaven for wildlife lovers and photographers. The Ranthambhore Tiger Reserve is a home to a wide variety of wildlife animals and birds such as tigers, bears, leopards, baya weaver, bar headed goose and many more. At RanthambhoreGuides.com, we provide you with all the related information and services such as gypsy booking, hotel booking, car rentals, sight seeing, etc. Thus making it a pleasurable and divine experience for your visit to Ranthambhore. 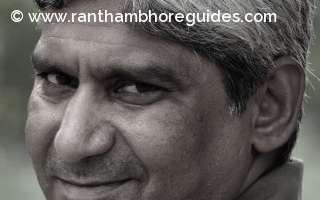 The RanthambhoreGuides.com provides you the details regarding nature guides, tiger sightings, weather forecast, tour operators and travel agents, etc. Come! Explore Ranthambhore with us and feel the thrill of wilderness blended with the charismatic history. Ranthambore Tigress Lightning, T-83 Shifted to Mukundra Hills Tiger Reserve from Ranthambore National Park, Rajasthan. Tiger, Packman aka T-85 found dead on the main track in Ranthambore National Park, Rajasthan. The two newborn tiger cubs were spotted with their mother, Arrow-Head aka T-84 in Ranthambore National Park! Planning your dream trip can be a difficult task. We have put together all the best Hotels, Restaurants, Hospitals, Doctors available near Ranthambhore Tiger Reserve. Click category images to find the related list.